I am a long term care planner, and I do a lot of work giving free advice on what will happen and how to best prepare for it, even if the need happened yesterday. A family member or loved one needs long term care and needs advice. Where do I go to find this? What will this cost? We don’t have enough money to pay for this kind of care, what can we do? Babies do not come with instruction manuals and neither does long term care. Just like most everyone else you wade in without a road map to negotiate a system you know little about. 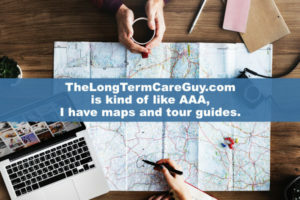 TheLongTermCareGuy.com is kind of like AAA, I have maps and tour guides. I know resources who can help you choose the right facility for your loved one and I can provide information on qualifying for Medicaid without inadvertently incurring any penalties. Would you like to protect some assets for family? Yes, this can happen. Remember that Medicaid will only pay once completely impoverished which includes cashing in life insurance that will pay out more than $1500 (which won’t get you down below the frost line in Wisconsin). However, parts of that policy can be saved versus just cashed in and lost. I am a long term care planner, and I do a lot of my work in simply advising on what will happen and how to best prepare for it, even if the need happened yesterday. There is no cost for this, but I may offer information on long term care insurance to the family members who would like to be sure they have access and choices for their care. Call me at (920) 884-3030 and we can investigate solutions or simply give some advice. No need to start this trip without a map.